How to Create Gigs Like a Pro! 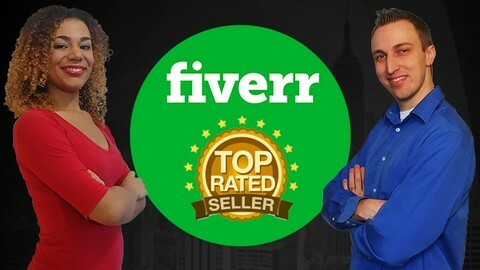 How to Make Money on Fiverr Even If You Don’t Have Any Skills! Buy this and get TWO COURSES for the price of ONE COURSE! I’ve been selling on Fiverr as a Top Seller for over 3 years now. In this Fiverr Mastercourse, you’ll discover how to research and find the gigs that are sell best on Fiverr. You’ll learn how to set up your gig offerings exactly like Top Sellers do, and how to optimize your profile and gig listings for maximum traffic. I’ll even share some inside Top Rated Seller tips, so you can earn more sales & reviews in less time and run a highly successful Fiverr business from the comforts of your home. Learn How to Build a Lucrative Side Income with Fiverr FASTER! ✔ How I Discovered Fiverr & Became a Top Seller Quickly & How You Can Too! *Even after earning a Top Rated Seller status, you can be still be demoted if you don’t stay active! That’s why I’ll also be showing you how to deliver 5-Star quality service to every customer to ensure you remain a Top Rated Seller. After enrolling, you’ll also have personal access to a Top Rated Fiverr seller (myself), that’s been a Top Seller for more than 3 years so you can get advice, feedback, and support as you implement these strategies for yourself. THE Most Comprehensive Fiverr Course – Find Out What REALLY Works! This course will show you what it takes to be highly profitable as a Fiverr seller right from the very start. I cover the ins and outs of crafting your offers so you understand exactly what it takes to create a valuable service that sells well time and time again. I’ll also share how to double your gig sales and traffic so you earn more each month. (*Mmm…I can almost taste that extra guac. right now – can’t you?) I’m confident that with these strategies you’ll be able to save time and effort so you can get more from your Fiverr freelancing business. Whether you’re wondering how to get the best start on Fiverr or you’re looking to increase your Fiverr revenue, reviews, customer satisfaction, or reduce the amount of time you spend on deliveries, this course will help you achieve your goal. I’m revealing every technique, trick and secret that I have learned over the last 3 years selling on Fiverr as a Top Seller. And I’m ready to share the wealth by sharing my knowledge with you. This course is a tiny investment especially since you can earn back the cost with just a quick few sales – probably by the end of the week! So if you want to double your Fiverr business, starting today, then hit the “take this course” button. Don’t wait too long though, because every moment you hesitate you’re missing out on more sales & easy cash that could be in your pocket! You’re only regret would be that you didn’t find me sooner!